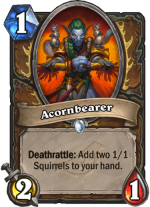 Acornbearer- you want to mulligan for this card because of the crazy tempo it gives you. It has really good value and the Deathrattle is insane for this deck because of how well it gives you a board for your minion buffs. 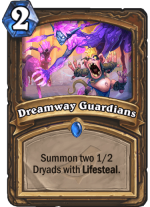 Dreamway guardians- This is another good pick for the board presence it gives you and the value you get through it. Playing this turn 1/2 is very good for you because you can easily snowball them through minion buffs, making it extremely hard for your opponent to deal with. 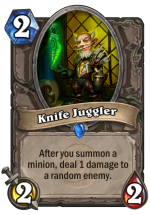 Knife Juggler- Knife juggler is extremely good for you because if you are able to get it to stick, it will make your opponent have a really bad game through its board pressure and tempo. 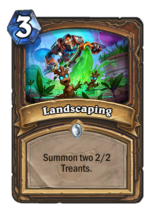 Landscaping- This card is just a great card to play on curve with your Dreamway Guardians/ Acornbearer because of the crazy heavy board it gives you. What you want to do with this deck is basically get some minions on the board for your buff follow-ups. This deck has great early game with Acornbearer, Landscaping, Knife Juggler, and Dreamway Guardians. It is extremely hard to counter a deck like this because of how much minion generation it has. Even against control decks this deck still prevails. With Wispering Woods, Force of Nature, Tending Tauren and The Forest’s Aid whenever your opponent clears your board it will only take you a turn to get another board back. So if you just keep refreshing your board then you will eventually get a board to stick and then you punish them hard for it with your insane amount of minion buffs. The inclusion of Archmage Vargoth is a little bit of a weirder pick but it definitely comes in useful. With Vargoth you are able to cast double blessing of ancients, (which gives you back an extra spell with Vargoth) Soul of the Forest, Force of nature, Landscaping, and others. The possibilities are nearly endless with Vargoth which makes it such a key card in this deck. Floop is good in this deck because if you play Vargoth and he dies then you can play another one through Floop. Floop also works through other combos like Tending Tauren when you need extra board presence or even Mulchmuncher when you need to kill a 3 or less health taunt or something for 0 mana. Overall I have played so many different Druid decks (being a Druid main) and for me, this one definitely takes the cake as the best Druid deck I have ever played. I am a rank 5-10 player and I have gone on a 17-5 run with this deck. it is the best deck I have played this expansion and I extremely encourage you to give it a try. It won’t let you down, I promise! !